In 1999, Chris Walter and others founded the non-profit organization called Barakat, Inc. This name is an Arabic and Persian term often used after a satisfying transaction and to bestow blessings and good will upon the other party. This organization is dedicated to providing educational opportunities to various ethnic groups associated with carpet weaving in Pakistan, Afghanistan and India and to preserve the earth’s environment. Barakat, Inc.’s board of directors made the unanimous decision to support global projects saving imperiled habitat and is now working together with the Nature Conservancy to support seven different projects. 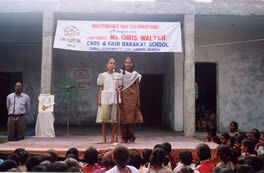 Barakat, Inc. is active in supporting the building of schools in India and Pakistan. At present, many of the refugees in Pakistan are returning to their homeland in Northern Afghanistan and Barakat is planning to help with education and health facilities during this transition. 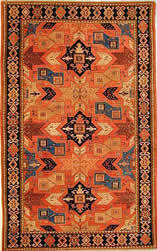 A large part of the donations to Barakat come from the year-end profits of Chris Walter’s Yayla Tribal Rug Company. We feel very fortunate to be involved with this high-minded project, which is supporting the weavers while producing some of the finest rugs being made today. 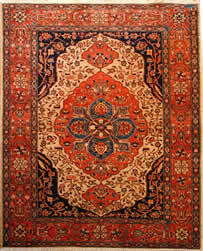 Many of these new rugs have the appearance of 80-year-old masterpieces and will grace homes for a long time to come. To learn more about the Barakat project visit their web site at www.barakatworld.com. 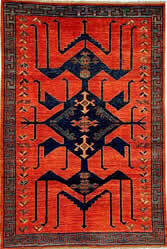 View our collection of Barakat Cultural Survival Rugs. The following excerpt was taken from the January 2008 Barakat newsletter. The original pdf newsletter can be viewed here. If you ever have the fortune to meet Paul and Eileen Jorgensen, it will not take you long to notice their love of spreading knowledge of fine vegetable-dyed carpets and their commitment to the people who make them. Paul and Eileen’s journey of discovery into the mysteries of rugs began with a trip to India, where they were deeply impressed with the tradition and beauty of Oriental rugs. Because The Jorgensens believe that one’s appreciation for rugs can be greatly enhanced through the study and understanding of the rich tradition behind them, The Magic Carpet offers two lectures and exhibits a year, featuring different aspects of the rug weaving world. When they first learned about Barakat from Chris Walter, the founder of Yayla and Barakat, they had already been importing rugs from DOBAG—the first women’s rug weaving cooperative in the Islamic world. Upon learning that Barakat’s projects provide services that benefit rug weavers of Afghanistan, Pakistan, and India, they were excited to support Barakat. Paul and Eileen believe that through supporting sustainable development projects for rug weaving communities, the world will continue to enjoy these ancient arts while supporting these talented artisans.